I had to do a little research to see what Jezebel Sauce is -- not sure I've ever had it before. According to Google, you can serve this with cheese and crackers, or use it on ham. 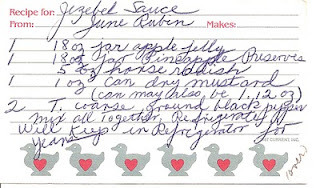 The recipe is credited to June Rubin.